What do you call a marketing phenomenon when the practice by which a rival company attempts to associate its products with an event that already has official sponsors and takes the competitor head on. We are talking about Ambush Marketing. In a bid to position its juice brand B Natural as the healthiest choice out there, ITC has taken to some classic ambush marketing. 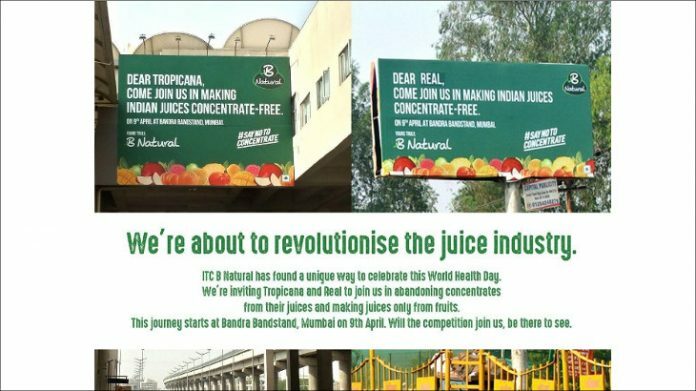 ITC with its B Natural brand with a new set of advertisements has started attacking PepsiCo’s Tropicana and Dabur’s Real. The team has also started a hashtag #SayNoToConcentrate to promote the product. Following are some of the tweets made from both the sides. Do not let fruit concentrate squeeze out the natural nutrients like Vitamin C from your packaged fruit juices! We are here to make Indian juices free from Concentrate.
. @IndiaTropicana We have not yet received your confirmation that you’ve received our invitation to join our #SayNoToConcentrate campaign. But we hope to see you there on 9th April. In a significant move Tropicana has responded with a hashtag of its own #ConcentrateOnTheFacts. As stated by Tropicana’s communications team in a press note the brand is now looking to “drive focus to the true facts and to make consumers aware that there is no significant nutritional difference between ‘from concentrate’ and ‘not from concentrate’ fruit beverages”. What has made matters worse in this classic case of ambush marketing is that it has reached the courts and PepsiCo has taken legal action against ITC in the Delhi High Court. Hon’ble High Court has directed ITC to suspend the advertising campaign, and remove all references to the Tropicana brand. Microsoft Windows 8- Will the customers switch to a new OS?